A completely filled Ziggo Dome was in anticipation of the start of the show at 8 PM. 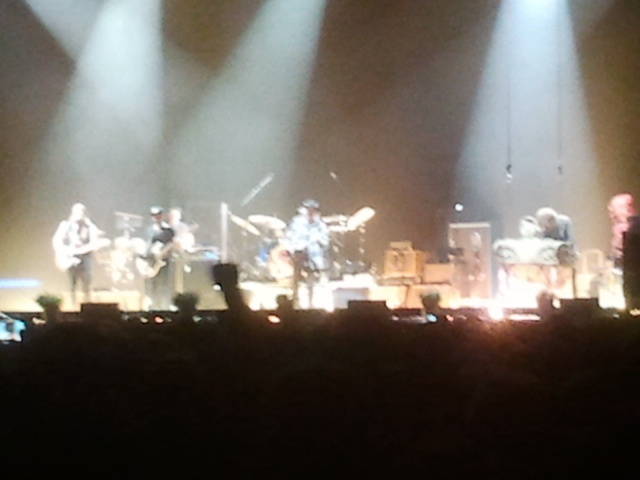 No support act, just Neil Young and band. The lights were dimmed. On stage three farmer types were sowing plant seeds or feeding chickens on stage. Tending to the proverbial earth on stage when a fourth farmer type settled behind a battered old piano totally at the left side of the stage. Almost unnoticed he started playing as if at home and not in a dome with 16, 17.000 fans. Hat on, chequered shirt, what looks like a stereotype of the U.S. farmer. Totally in line with what we were seeing 'After The Goldrush' was played. Consistent as well. Between this song and 'Monsanto' may lie 45 years, environmental concerns are never far away for Neil Young. 'After The Goldrush' was the start of a half hour Neil Young in singer-songwriter modus. Those fans were certainly pleased with 'Heart Of Gold' on guitar and the loudly blaring harmonica, followed by several other favourites like 'Needle And The Damage Done'. Between the songs Young walked around as if in his yard acting the farmer. After circa 30 minutes three cropdusters entered the stage, with loads of fumes that almost turned into fire when lighted at the correct angle. Through the fumes the band entered the stage for some lightly country tinted songs from Young's back catalogue. Songs like 'Hold Back The Tears' and 'Human Highway' were played. Neil still on his acoustic guitar the band playing softly around him. With Promise of the Real, Neil Young has a new formidable young band around him, including a percussionist, two guitarists of which one moves to piano when necessary, a bass player and a drummer. All styles were played with loads of dynamics throughout the evening. If the quality of Promise of the Real was doubted at the time of the release of the 'Monsanto' album, those doubts can be stuffed away forever. Together they are a volatile beast. After circa one hour Neil's Gretch came out for the more howling songs. Not long after the dark and old Les Paul came out for the dark growls. By then the show had moved on into the mid-tempo rock songs Neil Young excels in. All sorts of songs came by except the big, epic guitar anthems like 'Cortez The Killer' and 'Like A Hurricane' ( yes, my only complaint of the evening) and the deep country style songs. I started to notice that from most songs from his 70s album songs came by and it finally happened: 'On The Beach' was not passed by. During 'Revolution Blues' I was sort of elevated. This song is sooooooo good and it got an excellent rendition. The other thing I noticed was that 'Sleeps With Angels' got a lot of attention too. Coincidentally that was the album I played over dinner to get myself in the mood. Before 11 PM 'Rocking In The Free World' was played and that seemed like a nice ending to the show. It wasn't. 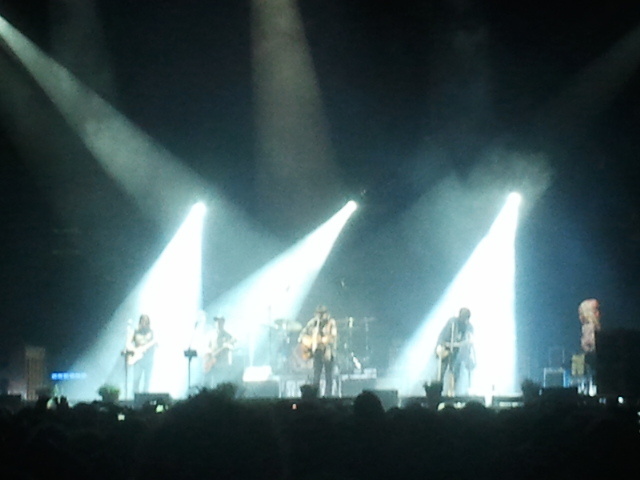 With a, to me, unknown beautiful song, Neil and band ended the show at 11.38 PM after a sort of second encore. 3 hours and 38 minutes of rock and roll at an impressive high level. 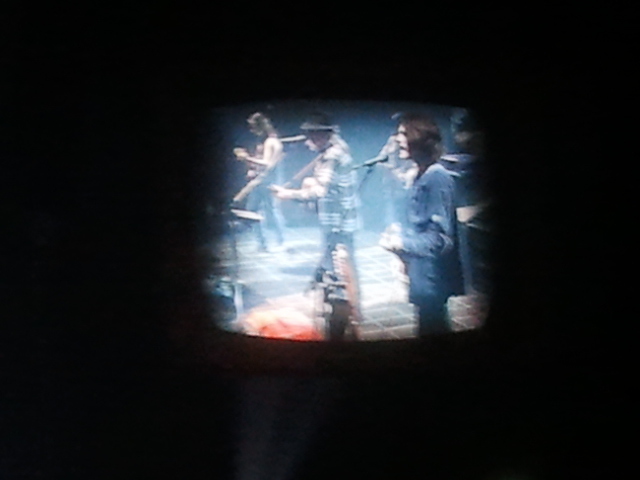 Neil Young at 70 is playing like there is no tomorrow. I can't remember what year it was, I was present at a Neil Young and Crazy Horse show in Ahoy, Rotterdam and vowed never to go to another show again. I'm glad I was not true to my vow. This was top of the bill. I woke up with my feet hurting, but this was so worth it. To end, cudos for the sound in the Ziggo Dome. It was so good to be able to hear most of what was going on in a great and distinctive way and never too loud. Not one moment, not even once in the famous deep, dark feedback ridden growling endings to songs at the end of the show I thought about the need to protect my ears. Now all is relative, but this was the best sound at a huge show ever as far as I'm concerned.